Can You Believe These Three Things About Symphony of the Seas?! 2018 may be flying by but it feels like November is still so far away. What’s so great about November? Besides the cooler weather and Thanksgiving turkey, November is when Royal Caribbean’s Symphony of the Seas makes her U.S. debut! We’re just weeks away from the newest Royal Caribbean ship making her home in Miami, FL – she called Barcelona, Spain home during the summer – and we almost can’t contain our excitement anymore. To tide you, and us, over until her stateside arrival, we’re sharing three fun facts you probably didn’t know about Symphony of the Seas. When Royal Caribbean said Symphony of the Seas was for the whole family, they weren’t kidding. 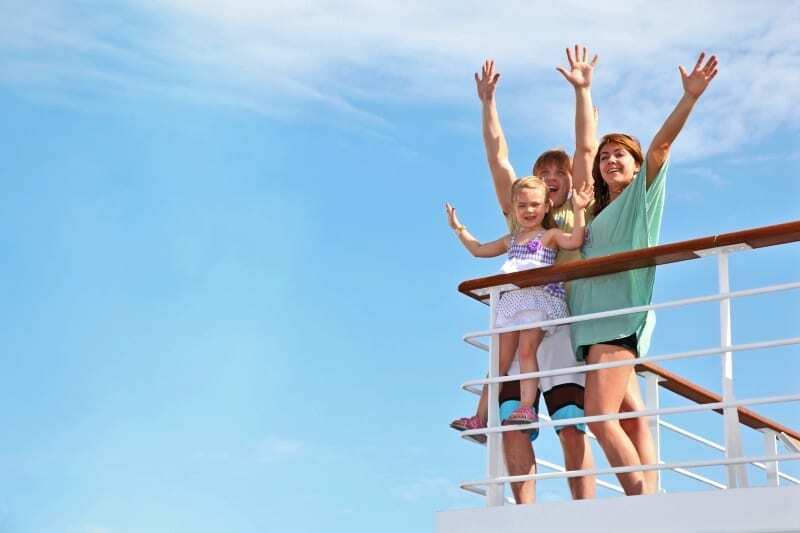 Their newest ship will debut a new style of stateroom known as the Ultimate Family Suite. This is a two-level, two-bedroom interactive suite that accommodates 8 people and features an indoor slide, a 3D movie theater-style TV room, and a wraparound ocean-view balcony with a full-size whirlpool. Plus, each Ultimate Family Suite comes with a Royal Genie that’ll make sure your every want and need are more than satisfied. New ship, new digs, right? Symphony of the Seas will be the first ship to call the new, state-of-the-art Terminal A home at PortMiami. This terminal was built exclusively for Royal Caribbean and will expedite the check-in process. This means more time for relaxing, adventure, or however you want to spend your vacation. Most cruise ships have a Godmother or father, but the Symphony of the Seas has her own Godfamily! Royal Caribbean asked actors Carlos and Alexa PenaVega and their son, Ocean, to be the first-ever Godfamily for the new ship. Why them? The millennial couple got engaged aboard the Oasis of the Seas, had a babymoon on Allure of the Seas, and filmed a Hallmark movie aboard the Harmony of the Seas. It only makes sense that these Royal Caribbean fans were asked to be the first Godfamily. Check out how Royal Caribbean popped the question in this super cute video. We definitely watched it more than a few times. You probably already knew this. Slightly larger than sister ship, Harmony of the Seas, Symphony of the Seas is officially the world’s largest cruise ship. She’ll weigh 230,000 gross registered tons – which is too big of a number to fully comprehend. The important thing to take away from this is that there’s way more fun and adventures to be had. Get ahead the winter blues by traveling aboard the Symphony of the Seas! She’ll spend her winter sailing around the Caribbean – and so can you. Between November 1st through December 4th, you can buy a cruise and get your second guest 60% off on any sailing on or after December 1st, 2018*. Want to bring the whole family too? Don’t worry because with the Kids Sail Free* offer, you totally can. With these two amazing offers, now is the best time to book Royal Caribbean! *Terms and conditions may apply. Please ask your travel agent for full details.